And check out OUR NEWLY LISTED ITEMS. 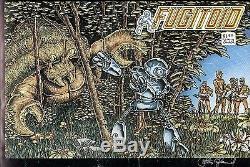 This is an original cover proof for Fugitoid #1, published by Mirage in 1985. This is a full-color uncut/unfolded proof of the cover, including both the front and back covers, and with printing on both sides of the covers, the same way it looks in the published comic. The proof is large, and measures approximately 11 1/4" by 18", and is on a high-quality paper. The piece has additional black border areas that aren't shown in the scan, and there is edgewear and crease lines there also, with some light water staining also visible on the inside back side cover. But there is no dot pattern in the blue area like what shows in the scan. That is only in the scan, and the full piece is not shown since it was larger than the scanner. This issue is one of the earliest efforts by TMNT creators Kevin Eastman and Peter Laird, which though released later on, was started before TMNT #1 was released, and then tied in to TMNT continuity around TMNT #5. It doesn't show up good in the scan, but it's signed by both Eastman and Laird in the lower right corner of the front cover. It is hand-signed in silver ink near the lower right side corner by Peter Laird, and Kevin Eastman's signature in pen is slightly to the left above it (it's hard to see because of the blue pen ink he used). Production pieces from early Teenage Mutant Ninja Turtles-related issues are incredibly sought-after, and almost never appear on the open market. Don't miss out on a rare chance to get a very cool and rare comic collectible that you will hardly ever get a chance to see, from a key early first issue that has been hand-signed by both creators of the TMNT! Please note that this is an authentic piece from the 1980's, not something made for a later reprint or collection book. We have been told there are reprint production art pieces being listed by other sellers that make them seem to be old and from original printings, even though they are not for example, older production art did not have the words on a separate sheet from the images. Those kinds of things were only done much more recently, using computer technology. We advise buyers to be careful, as there are disreputable sellers tricking many people into believing they are purchasing items that are older and more valuable than what they actually are. Some sellers simply do not state their items are from reprints, while others make very long listings and put a tiny mention about reprints buried deep in the listing, and/or use a hard-to-read font color (like yellow) to prevent buyers from seeing this information. Unfortunately, everything else in the listing the title, pictures of the cover of the comic from the 1st printing, etc. This item is a genuine proof from the'80's, not something made for a reprint. Check out our other auctions for more great items. Check it out, you'll be glad you did! The item "FUGITOID #1 TMNT 1985 ORIGINAL COVER PROOF PRODUCTION ART SIGNED EASTMAN & LAIRD" is in sale since Thursday, May 29, 2014. This item is in the category "Collectibles\Comics\Original Comic Art\Covers".